On May 19-23, U.S. Coast Guard (USCG) Cutter Cormorant, an 87 foot coastal patrol boat based out of Ft. Pierce, Florida, visited Freeport, Grand Bahama, for a one-week subject matter expert international exchange between the United States and The Bahamas. The training focused on maritime law enforcement and included members of the Royal Bahamas Police Force (RBPF) Marine Unit, the USCG, and the U.S. Drug Enforcement Administration (DEA). USCGC Cormorant is assigned to Coast Guard Sector Miami and performs a myriad of law enforcement and search and rescue missions in the Florida Straits. The training, entitled “Law Enforcement and Boatcrew Procedures Training” consisted of class room and hands on training covered ranging from vessel searches, handcuffing, boatcrew duties, man overboard drills, seamanship, and some basic navigation. U.S. Chargé d’Affaires John Dinkelman and Assistant Commissioner of Police in charge of Grand Bahama Emrick Seymour presented fourteen members of the RBPF certificates of completion following the training program. The week’s activities were viewed by all participants as incredibly beneficial and informative as well as an outstanding opportunity to get to know one another and strengthen international partnerships. The Coast Guard and the RBPF intend to capitalize upon the momentum generated by this visit and plan and execute even more robust exchanges in the near future, which ultimately will serve to improve each agency’s overall interoperability and responsiveness. 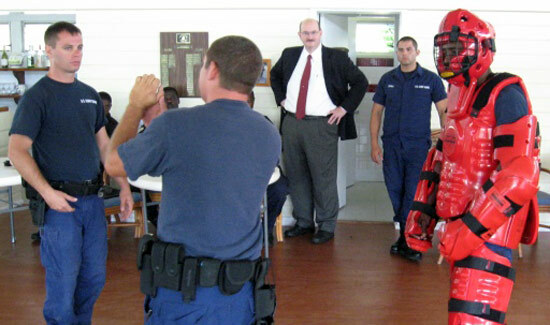 Top: Members of the RBPF Marine Unit, the USCG, and the DEA participate in law enforcement and boatcrew training on Grand Bahama. 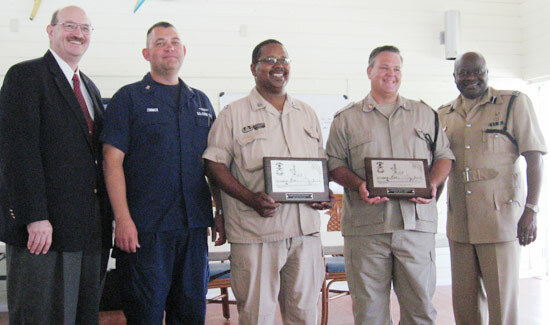 Bottom: U.S. Chargé d’Affaires John Dinkelman, Assistant Commissioner of Police in charge of Grand Bahama Emrick Seymour and a representative from the U.S. Coast Guard make presentations to the RBPF’s Marine Unit Inspector Robert Osborne and Inspector Doyle Burrows.